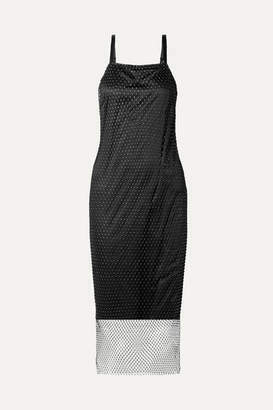 Composed of blue and black marled knit, Opening Ceremony's Lotus dress is accented with a self-tie side cutout. Designers Carol Lim and Humberto Leon finish the figure-contouring look with a flounce hem. Jewel neck. Sleeveless. Side cutout. Flounce hem. Silvertone hardware. 46.5 from shoulder to hem (approximately). Concealed back zip closure. Lined. Available in Blue/Black. 49% polyamide, 45% polyester, 6% elastane. Machine wash. Imported. Our model is 5'10"/178cm and wearing a size Small. Opening Ceremony Women's Lotus Marled Knit Cutout Dress - Blue Size XS A great designer gift. Stay on top of Spring trends and shop Opening Ceremony at Barneys Warehouse.